Does religiosity protect against suicide? The high rate of suicide this time of year got me wondering if religious involvement lowers one's risk, so I looked for a study (Taliaferro, L., Rienzo, B., Pigg, R., Miller, M., & Dodd, V. (2009). 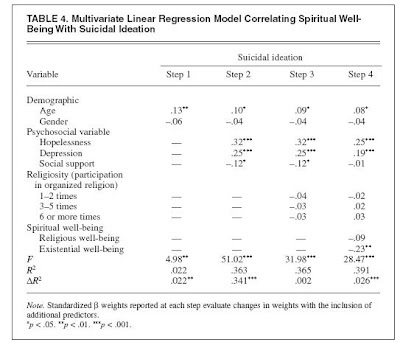 Spiritual Well-Being and Suicidal Ideation Among College Students. Journal of American College Health, 58(1), 83-90.). The above table lists the correlations from a study of 522 college students. I don't know why their measure of religiosity is not included here, but you can see that all three types of well-being--spiritual, religious, and existential--are negatively associated with feeling depressed, hopeless, and suicidal. ("Spiritual well-being" is simply the summed scores of religious and existential well-being.) Religious well-being measures satisfaction with one's relationship with God, while existential well-being concerns satisfaction with life and finding meaning and purpose in it. This table shows that people who attend church frequently have lower levels of hopelessness, depression, and thoughts of suicide, as well as greater social support. This table displays the multivariate results. It turns that that when you control for other relevant factors, religious involvement (religiosity) does not lower your risk of having suicidal thoughts. Not surprisingly, feelings of hopelessness and depression are associated with more thoughts of suicide, but even after taking their influence into account, finding meaning and purpose in life (existential well-being) appears to reduce thinking about suicide. Religious well-being, by contrast, exerts no independent influence. So what seems to be crucial for a person is to find a way to avoid feeling that his life is pointless. Religious people often succeed at this--the correlation between religious well-being and existential well-being is a fairly strong .46--but irreligious people can find it as well. Nietzsche got this one right: "We may handle any how, if we only have a why." (Let me add that all these questions about various dimensions of satisfaction are probably tapping, in part, personality traits. It goes without saying that Standard Social Science Models (SSSM) like this one are misspecified). Blacks score highest on "lie scale"
A reader raised the question about racial differences in honest self-reporting. I ran across this study of 980 children with a mean age of eight. 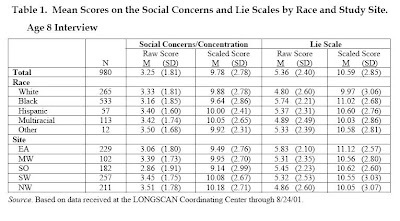 It found that black children score the highest on the "lie scale" (with questions like, "I never get angry"--obviously dishonest if you answer yes), while Hispanic children scored the highest on concerns about living up to others' expectations (the "social concerns scale"). Whites scored lowest on the lie scale. The black-white gap is 37 percent of one standard deviation--a moderate difference. 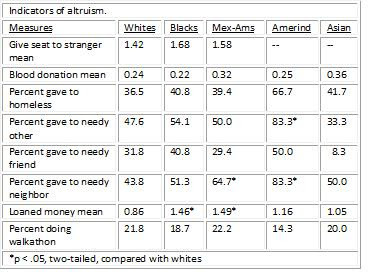 I was curious to see if there were differences in altruism among large white ethnic groups (GSS data--Americans). Results are shown in the table. I don't see any general differences. Perhaps you do. In The 10,000 Year Explosion, Gregory Cochran and Henry Harpending claim that agrarian living selected for stinginess. A farmer who gave away all his seed was left with nothing to plant in the spring. This might explain results from a GSS analysis described in the last post. I've reproduced the findings in the table above and added estimates for Amerindians and Americans of Chinese and Japanese descent (combined into an "Asian" category). With their deep agricultural histories, you would expect whites and Asians to hold on to their money more tightly. It looks like they do. While they don't seem to differ on non-monetary forms of charity like participating in walkathons, they are less likely to give or loan individuals money. Compare whites and Asians to American Indians, for example. Twice as many Indians as whites have helped a needy neighbor. Keep two things in mind, however. Pure opportunity might explain these numbers. NAMs associate with more needy people than whites or Asians. (On the other hand, whites and Asians have more money to give). Also--sample sizes are small for everyone except whites. 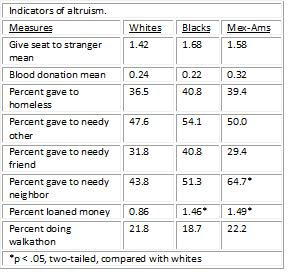 As a follow-up to the last post, I used GSS data to investigate racial differences in altruism. The only significant differences are that Mexican Americans are more likely to give money to a needy neighbor, and both Mex-Ams and blacks are more likely to loan money to friends, family, etc. This can be explained in terms of greater opportunities to help: both groups have more friends, relatives, and neighbors who are in need. The overall picture here seems to be no differences, or whites slightly lower. In my earlier posts on ethnocentrism among Jewish Americans, commenters provided estimates from GSS data suggesting that Jews are altruistic. In using the term ethnocentric, I wasn't implying that Jews are uncaring toward others; only that they have affection for their own. Their liberalism despite great wealth leaves me with the impression that they care about non-Jews. I calculated means and percentages for all the GSS questions I could find that tap general altruism. Generic questions about charitable contributions are not good since, for all we know, people are donating money to within-ethnicity causes. Even the questions listed above have problems. Jews are concentrated in urban areas, so questions regarding giving up a seat on a bus or giving money to a homeless person will favor them. (In the question on giving up a seat, I limited it to people living in cities with at least a million people). On the other hand, non-Jews are advantaged in questions about giving money to needy friends or neighbors. As a wealthier group, Jews are less likely to have friends or neighbors in need. The same could probably be said of some friend, acquaintance, or family member in need of a loan (LENTTO). Participating in walkathons or donating blood are better questions: percentages seem to be the same for walkathons, while non-Jews might be more likely to donate blood. Jews, along with those having no religion, certainly shine in terms of giving money to racial organizations. I imagine this is mostly black orgs like the UNCF. I'd chalk this up to greater liberalism. Judge the numbers as you will: I see little evidence here that Jews differ from others on general altruism. 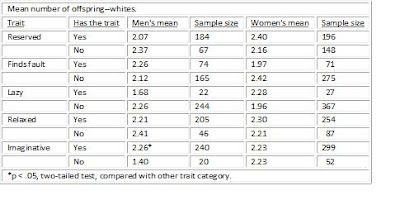 As a follow-up to the last post, I regressed agreeing that one's ethnicity is important (ETHIMP--GSS data) on a list of variables that seemed predictive when looking at the bivariate associations. The table displays the results. I included p-values since so many of them are just shy of the .05 cutoff. You can read p-values as the chance that the relationship between the predictor and ETHIMP is actually zero. Believing there should be a law against marriage between blacks and whites is the only independent variable significantly related to thinking one's ethnicity is important. It also has the largest beta. Older people, those living in the South, political conservatives and people who are religious fundamentalists are more ethnocentric (but not significantly so). Gender and church attendance, on the other hand, have high p-values so there is a good chance they are unrelated to the dependent variable. The results here are stronger here than in the last post probably because the measure of ethnocentricism is more normally distributed. Although the model explains little variance in ethnocentrism (R-squared is only .056) it does suggest that if Americans are encouraged to adopt multiculturalism for themselves, it will take the form of what you would imagine emerging from the South: one that is racialist and conservative. We saw in an earlier post that ethnocentrism increases among Jews as one moves in an orthodox direction. Is that true of other whites as well? For a preliminary analysis, I looked at potential predictors of tribalism among whites (with closeness to one's ethnic group as the measure (ETHCLOSE)): low IQ, low education, low job prestige, political conservatism, and church attendance. None of those is more than trivially related to ethnocentrism--correlations were all well under .1. The measures in the table above were the only ones I could find that seemed predictive. I entered all of them into an OLS regression model and displayed the results above. Being female and living in the south are the only factors significantly related to feeling close to one's ethnicity. The effect of being a fundamentalist falls just short of statistical significance. Racialism, measured as favoring a law against marriage between blacks and whites, is unrelated to ethnocentrism. Looking at the betas, you can see that gender, southernness, and fundamentalism all have a similar impact (if you ignore the lack of significance for fundamentalism). I checked to see if females were responding more than males to the "feeling" aspect of the question. When we substitute thinking your ethnicity is important to a sense of who you are (ETHIMP), the gender effect disappears. I can see there are other differences as well, but that will have to wait until next time. In What's So Great about Christianity, Dinesh D'Souza claims that one of the psychological reasons why people adopt atheism is because they are very sexual and most traditional religions put heavy restraints on sexual behavior. Who wants to believe in all those rules when you have the libido of a bonobo? I looked at infidelity to see if there was a relationship between skepticism and deviant sexual behavior. The table shows that there clearly is. As skepticism grows, so does the risk of cheating. Compared to believers, all categories except "believes sometimes" have significantly higher rates. Atheists are almost twice as likely to stray. (This finding is also consistent with the greater sexual deviance and skepticism seen among men). Of course, this link does not identify what is causing what. Steve Sailer asks: "Is there anyway to look at cohorts over time to see if ethnocentrism increases with age? I suspect ethnocentrism sets in more when you start thinking about grandchildren, but that's just a guess." The GSS question on one's closeness to his ethnic group (ETHCLOSE) was asked in 1996 and 2004. I calculated the mean score for all whites in their 50s in 1996 and got 2.84. 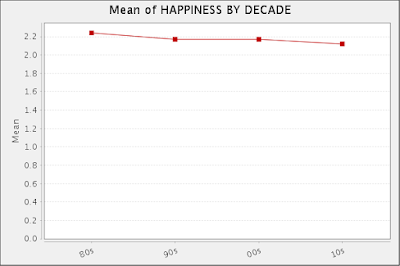 Next, I computed the mean for people ages 58-67 in 2004 (since the earlier group had aged 8 years). Their mean is 3.12, almost one-third of a standard deviation higher. The difference is not quite significant at the two-tailed 95% confidence level, but the small samples (143 and 137) do not help. I take this as evidence that Steve is right: tribalism rises as you reach the age when grandchildren are in your thoughts. Comments by The Undiscovered Jew (TUJ) in the last post motivated me to look at two items. He stressed that no one seems to back up claims of Jewish ethnocentrism with peer-reviewed research. Looking at the Academic Search Complete database that has 11,200 journals, I did a search on "Jews" and "ethnocentrism" and failed to find even a single relevant article. The closest I could find was a 1976 article studying the integration attitudes of liberal Jews and WASPs working for some civil rights organization in Los Angeles. Worthless. 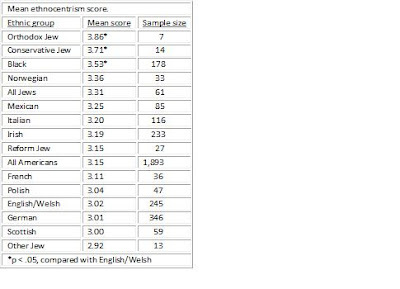 I did find an article based on GSS data examining the ethnocentrism of gentiles. There are no relevant studies because people are terrified of this kind of topic. The only articles conducted are on anti-Semitism. TUJ's other point is that I'm basing my conclusion on only one analysis. I've provided evidence before that Jews rank high on ethnocentrism among American ethnic groups here, here, and here. Let's use the ETHCLOSE variable that TUJ uses in the comments. Respondents are asked how close they feel to their ethnic or racial group, with answers ranging from "very close" (1) to "not close at all" (4). I reverse-coded the values so that a high number indicates high ethnocentrism. 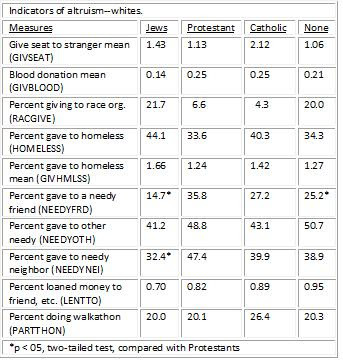 The means are shown above for all groups with at least 30 respondents. (The exception to this was to include different types of Jews as TUJ did in his analysis). Orthodox and Conservative Jews are the most ethnocentric of all groups. The only groups more ethnocentric than all Jews combined are blacks and Norwegians. Even Mex-Ams scored lower. I should say, however, that all Jews together were not quite significantly higher than Americans of English/Welsh descent at the two-tailed 95 percent confidence level. The Jewish/English gap is one-third of a standard deviation. On the other hand, TUJ has a point that tribalism varies greatly across types of Jews. While Orthodox Jews are one full standard deviation more ethocentric than Americans of English/Welsh descent, Jews with no religious affiliation actually score a bit lower than the reference group. (Keep in mind that the N's are tiny). I found evidence that Jewish Americans as a group are not hypocritical over issues of ethnocentrism. The table above reproduces the ethnocentrism scores I calculated in the earlier post. Groups with above-average scores I labeled "ethnocentrics". Groups with scores below the mean are called "individualists." Next, I found this question: "Some people say that it is better for America if different racial and ethnic groups maintain their distinct cultures. Others say that it is better if groups change so that they blend into the larger society as in the idea of a melting pot. Here is a card with a scale from 1 to 7. Think of a score of 1 as meaning that racial and ethnic groups should maintain their distinct cultures, and a score fo 7 as meaning that groups should change so that they blend into the larger society. What score between 1 and 7 comes closest to the way you feel?" The means are shown in the right column. 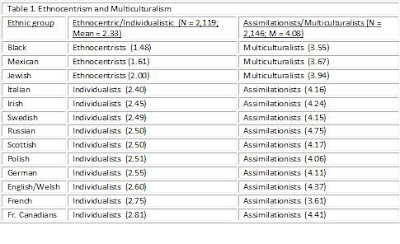 Those above the mean are categorized as "multiculturalists," while those below are labeled "assimilationists." All the groups, including Jews, are consistent. What Jews tend to favor is a society where ethnic traditions are maintained. They are ethnocentric multiculturalists. So where does that leave so many Americans whose families have been here for many generations, with ancestors from several different countries, who belong to no particular ethnic group? You can see that most white Americans are individualist assimilationists, but that attitude seems so 1950s. If the country follows the route favored by many Jews and other minority groups, the natural path for these other folks is to organize as white Americans NOA--not otherwise allied. These people have no culture, history or heritage other than a white American one. The country does seem to be headed in a multicultual direction, especially when you consider massive Hispanic immigration mixed with a multiculturalist elite, but I don't think an America with tens of millions of tribalist white people is quite what multiculturalists have in mind. UPDATE: Oops--I missed that Americans of Polish and French descent are individualist multiculturalists. Here's some evidence for the side arguing that Jewish ethnocentrism is not significant. I took the Jewish sample that was asked the question about the importance of one's ethnicity, and split it into two equal groups. The first group is people ages 18 to 54; the age range for the second is 55 and older. The mean "my ethnicity is not important" score for the younger group is 2.17 (n = 24); for the older group it's 1.83 (n = 24). That's three-tenths of a standard deviation drop in ethnocentrism among the younger group. The sample is small unfortunately, but combined with the high rates of intermarriage mentioned in the comments of the last post, ethnocentrism might be on the decline. One other thing: even if Jewish American ethnocentrism were approaching Italian American levels among young people, Italians don't seem hypocritical to me. To put it mildly, they're not known for their crusading anti-racism. UPDATE: Now that I think about it, the greater ethnocentrism among older Jews (that reaches levels similar to Mex-ams) might be explained as an age effect rather than a generational difference. People seem to discover their roots as they age. In the comments in the last post, some readers contended that Jews are not ethnocentric. Using the same question I used in the comments section--how important is your ethnicity for your sense of who you are--I calculated the mean score for all American ethnic groups with at least 30 people. Answers ranged from "very important" (1) to "not at all important" (4), so high scores indicate low ethnocentrism. The table shows that of the 13 groups big enough to measure, Jewish Americans are the third most tribalist group, behind only blacks and Mexicans Americans. 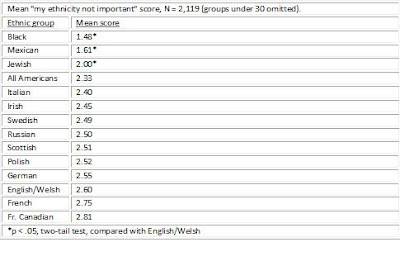 The difference between Jews and those of English descent (the comparison group) is statistically significant at the 95 percent confidence level. The standard deviation is 1.14, so the English/Jewish gap is slightly over 1/2 of a standard deviation. 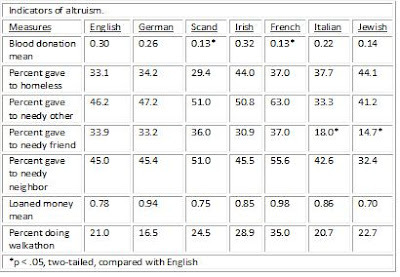 Irish and Italian Americans, thought by some in the previous post to be as ethnocentric as Jewish Americans, do not differ significantly from Americans of English descent. The gap between Jews and the Irish is 39% of one standard deviation; the Jewish/Italian gap is 35% of one SD. Jews are significantly less ethnocentric than blacks, but their mean does not differ significantly from that of Mexican-Americans (p < .05, two-tail test). (I wouldn't be surprised if this comparison would become significant if N were increased). The hypocrisy is getting old. My friend suggested I watch the film Everything is Illuminated. I knew nothing about the movie, but trusted his taste. Into it a couple of minutes, I could see that it was a quirky movie about honoring your family. That's a theme I'm interested in, and I was really enjoying the story of a young Jewish man traveling to Ukraine to find relatives left behind during World World II. That was until the story turned tribalistic. It was revealed that his tour guide--an elderly, anti-Semitic Ukrainian man--had actually grown up Jewish but turned his back on his people after narrowly escaping death at the hands of Nazis in the same area where the young man's relatives were from. Returning to the place where he had survived the shooting squad brought back all the events he had tried to forget. Guilt over abandoning his Jewishness drove the old man to kill himself. His grandson, who came along on the tour as translator, learned of his Jewish ancestry, embraced it, and had his grandfather buried in a Jewish grave. There wasn't the slightest indication that the young man or his relatives or the old man had any religious sentiment. The message was one of tribalism, not religious belief. Applying the film's message to yourself, a gentile will learn that it is imperative that you be loyal to your people; to sever ties from your people is an act worse than death. (A hero in the story was shot by Nazis for refusing to spit on the Torah). In reality, any gentile who does take the message of this movie to heart and loves his people will be called a racist, a bigot, and a hater. For everyone in the world except Jews, it seems, loving your people is a crime. For Jews, it's a crime not to. Some will contend that Jews are small and persecuted, so they have earned the double standard. I say that is completely unacceptable. To be considered legitimate, principles must apply the same to everyone. As I have argued before, you are racist if you argue for one set of rules for your group, and another set for everyone else. And it can't be argued that, while tribalism is immoral, religious loyalty is still considered legitimate. The characters in this film were not the least bit religious; this was a blood thing, as it is for many Jews. How ironic it is that the champions of anti-tribalism are some of the most tribal people in the world. It has got to stop. Who is more averse to the institution of marriage--men or women? The General Social Survey asked 164 white never-married respondents ages 18-49 would they want to get married if the right person came along. Twenty-eight percent of men said no, while only 13 percent of women said the same. The difference is statistically significant. Young adults might not have anything against marriage but feel they are too young to marry. If we limit the sample to only those ages 30 to 49, 22 percent of men are not interested in marriage, compared to only 7 percent of women. 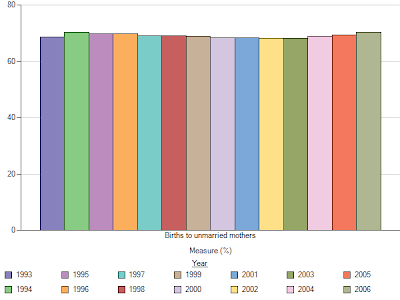 This graph (GSS data) shows trends in the answer to the question, "Do you agree or disagree: People who want children ought to get married." You can see the culture war is growing. Compared to the past two decades, there are more whites who strongly agree with the statement, but there are also more respondents who have no opinion or who strongly disagree. There are now fewer white Americans who simply agree. With blacks, there are also fewer now who simply agree that people who want to be parents should marry, but the slack has been picked up by the strongly agree category. There is perhaps a little bit of a moral renewal going on here. How great it would be if our moralistic energy were directed toward bad family decisions instead of things like using an outdated name for black people. (I witnessed an elderly professor get busted recently for accidently using the word "colored"). Black folks themselves would benefit much more from being shamed for having kids out of wedlock than being timidly referred to as "African Americans." People need social punishment for socially destructive behavior. I know that if I divorced my wife today and walked away from four children, not a person I know would express a single word of disgust because nowadays everyone is so non-judgmental and so compassionate. American society has gotten to the point where it does nothing moralistic to shape our behavior except to throw us in jail when we have really crossed the line. (Of course, it shames us mercilessly over contemporary concerns like gay marriage). Here we see that Mexican Americans are significantly more permissive toward illegitimate births than either blacks or whites. Just exactly how are these people social conservatives? To reinforce my point: a recent Pew poll revealed that more Mex-Ams favor gay marriage than whites: 45 versus 39 percent. 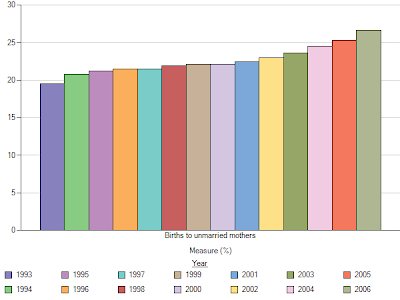 The above graphs shows the trend in the percent of all births to white unamarried mothers (CDC data). The percent has shot up in this decade from the low 20s to over 25 percent. For blacks, the level has been flat at around 70 percent since the early 1990s. 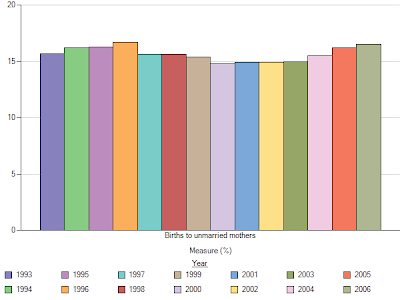 For Hispanic mothers, the share of illegitimate births has shot up from the low forties to 50 percent in just the past few years. Asian Americans have hung steady at 15-17 percent since 1993. They are the only group with numbers that are low and not getting worse (unless the little 3-year increase starting in 2004 portends something). It looks like the acceptability of bastardom, embraced by blacks long ago, has grown strikingly among whites and Hispanics in this decade. American decline continues right on schedule. While analyzing GSS data for the last post on church attendance and fidelity among married black men, I noticed the connection between religiosity and marriage. Of course, marriage has been in deep decline among black Americans since the glorious 1960s. Fewer than 70% of black women ever get married, and they are more likely than whites to divorce and to never remarry. The chart shows that frequent church attendance is often accompanied by marriage among blacks. (Both males and females are included: the pattern is very similar for both groups). Forty-six percent of married people attend religious services often (nearly every week or more frequently) compared to 27 percent of never-marrieds. (The difference is statistically significant at the 95% confidence level). All the noise about Tiger Woods reminded me of a question I wanted to look into: Are married, churchgoing black men less likely to cheat? The table (GSS data) shows the percent of married black guys who have ever cheated by church attendance. The variable ATTEND produced cells with very small sample sizes, so I collapsed them into three categories: rarely (never attends to once a year); occasionally (several times a year to 2-3 times a month); and often (nearly every week to more than weekly). This strategy puts roughly one-third of men into each category. While men who attend occasionally are not significantly less likely to cheat than those who attend rarely, frequent churchgoers have significantly lower rates. Rare attenders are almost 1 1/2 times more likely to be unfaithful. This sort of analysis cannot identify cause and effect, but there is evidence here that if you're married to a black man who goes to church all the time, you've got better odds that he's not fooling around. I'm particularly impressed with this fact, given that one meets many fine women at church. Do people with certain personalities have more kids? 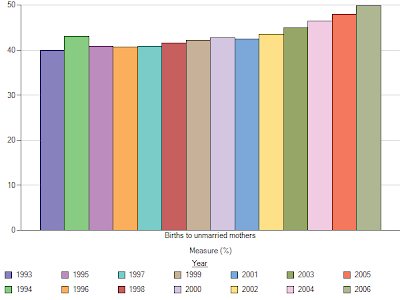 Using GSS data, I calculated the mean number of children of males and females who were at least 45 years old at the time of the survey. I used five questions that attempt to measure personality traits, and the table displays mean number of kids by possession of the traits. The only categories that are significantly different are imaginative and unimaginative men. The guys without imaginations have fewer kids. Notice how few men will admit that they lack this trait. Those who do are probably particularly self-aware, or they might be especially unimaginative. The other comparison that is almost statistically significant is finding fault among women. Females who admit to finding fault in others have fewer kids. As with imagination, few people are willing to admit that they do this. Keep in mind that the heritabilities of personality traits are roughly 0.5. There is little evidence here of differential fertility across personality types. (Let's also remember that individual items are poor measures of traits).